Afternoon guys and gals, I hope you are all having a lovely weekend. I woke up this morning to a ray of Sunshine which is almost unheard of this time of year in Scotland. I took the perfect opportunity to embrace the warm weather with a short-sleeved T-Shirt. 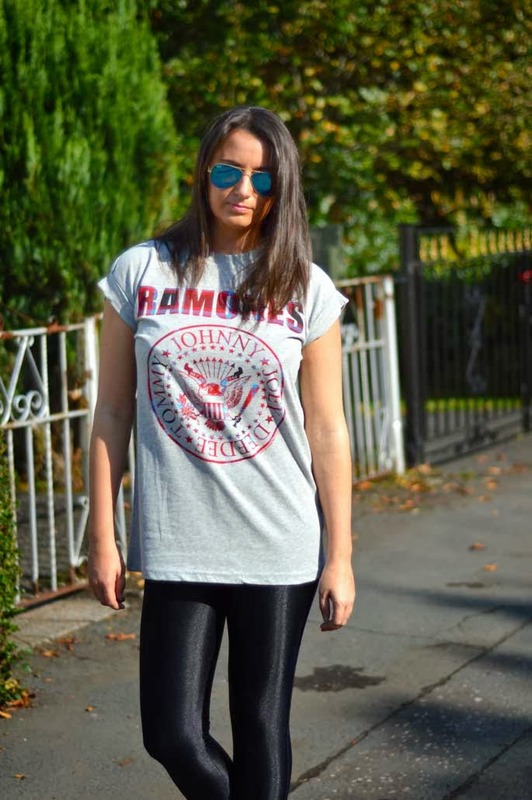 I love graphic tees and this Ramones top from Primark was no exception - I love the tartan printed band name. It's another way to wear this season's hottest trend without going all out on a full tartan piece. Have a lovely weekend from me and Yogi! Outfit Details: T-Shirt from Primark (instore) / Disco Pants from American Apparel / Heels from Dorothy Perkins Sunglasses from Blaze Sunglasses ** Dorothy Perkins are having a 30% off everything promotion both online and instore until tomorrow!